Click here for 17 full quotes from Bernie Sanders in the book Guide to Political Revolution, by Bernie Sanders. 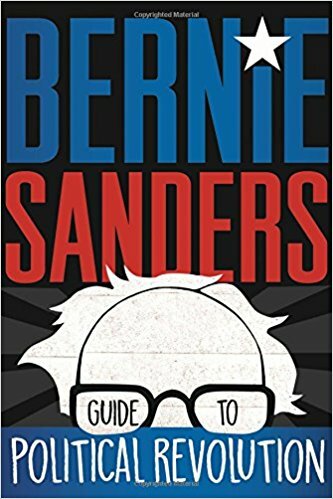 This book is a delight to read -- chock-full of hand-drawn graphics (like the cover above) and clearly summarizing a dozen major national problems alongside Bernie's proposed solutions. It's evidently targeted toward young adult activists -- Bernie's supporters who call themselves Our Revolution -- with citations to "Mobilize" and "Learn More" in each chapter. The book is physically small -- to encourage carrying it around to rallies, perhaps -- and sticks to policy points, rather than detailing history or methodology. On the other hand, the book doesn't say anything new -- everything in here has been said by Bernie during the 2016 campaign, and afterwards. It's really just a concise summary, rather than a detailed guide to how to accomplish the policy goals. Bernie's other books cover other purposes -- like the details of the daily life of participating in the "revolution" in Where We Go From Here, or the details of what happened during the 2016 campaign in Our Revolution. Those books are as tedious to read as are most political memoirs or political histories -- so we recommend this delightful book instead, as the required reading for anyone who wants to Feel the Bern. Undermining unions led to 40-year decline in middle class. 45% estate tax only for estates over $3.5 million. Regulate derivatives like the high-stakes wagers they are. Police forces should reflect diversity of their communities. Racist & failed war on drugs targets people of color. Education is the great equalizer on path to middle class. Rising oceans creating world's first "climate refugees". Workers need paid family leave and paid sick leave. Expand "Buy American" and "Buy Local" as government policy. Employer-based insurance burdens employers & stifles workers. Mental illness system is in tatters; treat like any illness. Give undocumented workers legal protections. Current $7.25/hr and $2.13/hr is starvation wage. Minimum wage increase helps economy because workers spend it. Women still earn only 80% of men; minorities earn 63%. Replace carried-interest loophole with progressive taxation. Welfare to low-wage workers subsidizes profitable companies.